Your first reaction will be anger and to dismiss the whole idea ... because of the outcome of it we now live with and are trying to undo. Lets put all the pieces together ... pieces not usually considered in mainstream culture but that is based on neuro science, attachment therapy, mind-body-soul modalities and science. This is contrary to what we know now that our first reaction to this is to be angry and to dismiss it, but I challenge you to consider some of the truth of it. It truly can be in an negative sort of way. In all of life we have to accept the negative in order to also acknowledge the positive. We do know that stress impacts women's milk supply and her milk impacts her baby. We might want to remember that women didn't even have the right to vote until 1920. Women have been unhappy a long in a male dominated world. They certainly did have a lot to be upset about and even today women have a whole lot more to be upset about in this modern world. How could this NOT be true? Our milk effects our babies.Our babies effect us and our milk. I'd like to research and to hear from people who might have information about how they came to believe that babies past 9 months would go blind and have "brain disease" when today we know that this absolutely the opposite. As a CranialSacral-based birth trauma therapist I do know that colic has much to do with the physiological and emotional experience of birth for the baby. You can read my old website Infant Parent Healing page on Colic. I know that the placenta is an informer for the baby of how the world is...through the mother, through her thoughts and feeling, through her hormones; and, I know that the breasts take over this job from the placenta. It makes so much sense to me that just like prenatally, the mothers emotional state, her stress will impact her milk and that this will be felt and experienced by the baby. How could it not? So, of course they were right. And if it feels uncomfortable to you then you might want to consider that it goes both ways. Her happy, contented emotional state can also help produce milk that is happy. .. truly of a higher quality. What they didn't understand is that life and the woman's experience in the world that they were creating was causing her a lot of stress. What they did was use it to further with disempower women's bodies and we need to make sure that we're not doing the same by not looking closer. Not throwing the proverbial baby out with the bathwater in our journey to reclaim our rights over our bodies, our babies, and birth and breastfeeding. We now have the eyes and ears and heart, mind, and research to look at the full picture on many levels that they didn't have then. I think if I or a farmer told you that a cow who's being abused and neglected and overpowered may not give the best quality milk and that the baby cow is reacting that this would be accepted. Farmers know, and we'd think, "Oh yeah, well sure." Why don't they apply this is to humans? All mammals, especially two-legged, because we have complex mental capacity experience stress in our daily lives. 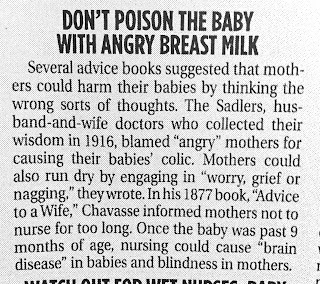 And don't we all know that in this holiday season breastfeeding mothers are going to be stressed, and their babies are going to reacting. Crying, belly aches and the old "colic" label will be pulled out by those in the environment who grew up with "bad information," as David Chamberlain would say. (Watch for his new book, "Windows to the Womb" coming out in January. GOOD information!) Those who were taught formula is better .. and other lies perpetrated even today. So, of course, they were very wrong too, and we live the consequence of this. The mis-educated, lied-to people of previous generations are products of a society that was taught to negate the true purpose and power of women's bodies. Breasts were sexual parts, for men's pleasure. 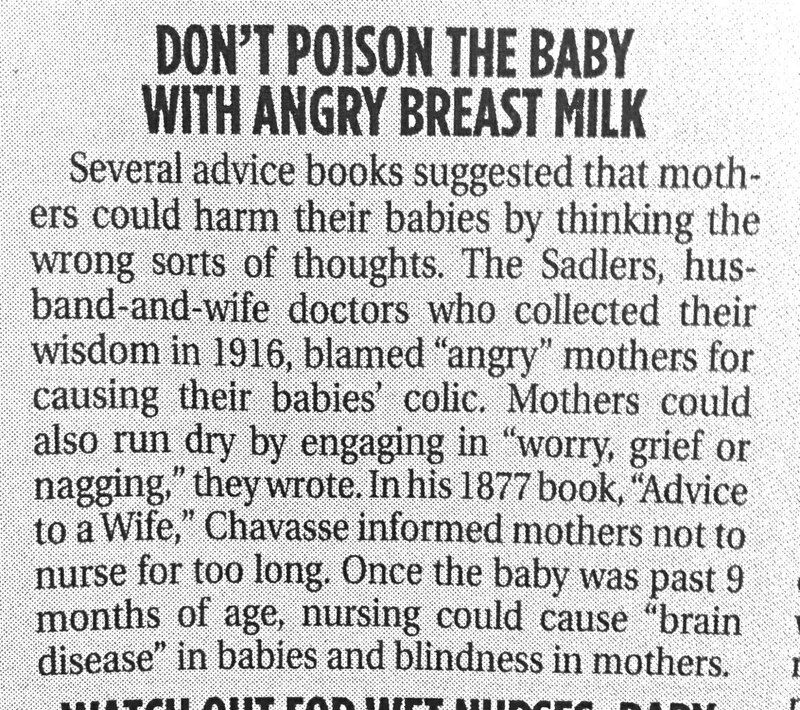 Women's defective bodies made "bad milk". They were taught that breastfeeding is bad so the extended, exclusive, exposed breastfeeding stresses them ... some of them probably will even get belly aches over it themselves this holiday season!! I find things like this to be such a gem ... It helps us understand the unwinding of this knot we got into and are undoing.